Canola production in Australia is a lot like Canada’s in many ways, but Dan Orchard was inspired by some distinct differences. Dan Orchard (looking at the camera) joined a group of Australian agronomists on a crop tour. Orchard was fascinated by their ability to identify specific varieties by their characteristics. I was lucky enough to attend a Brassica conference in Melbourne, Australia recently, and although the scenery and location was a huge draw, the agronomic information and sharing was one of a kind. I managed to fall into the hands of one of the most respected and knowledgeable agronomists I’ve ever met, and he found the time to take me and my friend and co-worker Nicole Philp on a 12-hour tour around some of Australia’s biggest canola-producing areas. We learned more than imaginable in that one day. I’ll share some of the ‘cool’ findings. One fascinating aspect of canola production in Australia was the grazing component. I also experienced this in Kansas and Oklahoma, but it seems to be more common in Australia. Some farmers actually send sheep and cattle into canola fields to graze in the spring, then it regrows and very little yield if any is compromised. Canola is typically in the rosette stage when grazed and is literally eaten down to the ground. This reminded me of our unfortunate and unwanted ‘grazing’ event Western Canadian canola growers often experience – we call it HAIL! We’ve all heard the stories about a grower getting a massive hailstorm when canola is ready to bolt, then the canola regrows and the grower harvests a near normal crop. Perhaps there is an opportunity here in Canada to harvest canola vegetation early, and harvest seed later!? OK, maybe Australia’s 200 or more days of growing has an advantage over our 100 or so days. Something else intriguing was the ability of some very keen agronomists to identify varieties by looking at them closely in the field. Plant height, distance between pods on the main stem, pod size and even where the pods tend to abort are all features they can use to identify specific varieties. It was hard to believe the accuracy and attention to detail with some of these agronomists. This has me wondering if we mistakenly blame environment, insects, fertility and other things which could cause pod abortion or small pods or other things when there’s actually nothing but genetics at play? 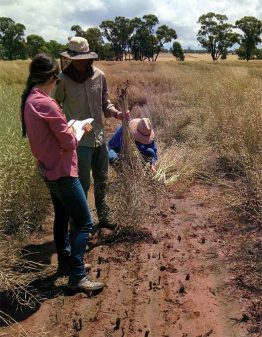 Finally, I developed a fond interest in the Australian findings that special canola varieties are able to penetrate soil up to two metres deep AND breakup hardpan, giving relief from compaction and eliminating the need for a tillage operation to do this. I believe some of our varieties are already doing this without it being our intent, and has made me wonder if our varieties differ in their ability to break up the soil. We may have another project for breeders to explore – a massive root which can break through anything. My experiences in Australia won’t soon be forgotten. The amazing landscapes, the massive buildings, the street parties and the stories about snakes and spiders. But most of all, meeting other agronomists and farmers from across the world with the same passion and dedication to produce food safely for our growing world was irreplaceable. That’s agriculture! Australian canola can experience aerial infection of blackleg, which are infections on upper stems and reproductive parts of the plant contributing to yield loss. 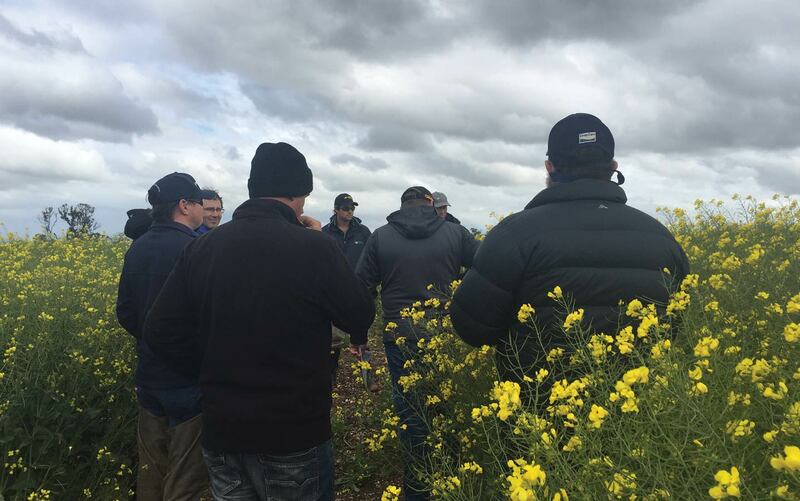 Where better to learn about blackleg in canola than where it is the most severe – in the Land Down Under, Australia. Blackleg is the most common and serious disease of canola in Australia. In Canada, blackleg falls behind sclerotinia most years and is trumped by the concern of clubroot. Although canola is grown in different conditions in Australia compared to Canada, Australian farmers face the same main fungus of blackleg: Leptosphaeria maculans. China, for example, is infected by the fungus Leptosphaeria biglobosa. One main reason symptoms are worse in Australia is the use of winter canola varieties. This gives the pathogen a longer period to infect the plant, creating further damage and heavier spore load on the stubble. 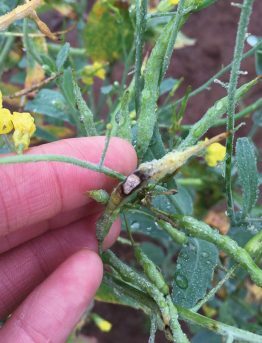 Australia also experiences aerial infections of blackleg, which are infections on upper stems and reproductive parts of the plant contributing to yield loss. This is not typically seen in Canada. Management of the disease is very similar in Australia, with recommendations to use resistant varieties, extended crop rotation and fungicides. In Australia, the Grains Research & Development Corporation (GDRC) has an extensive network of variety trials and blackleg nurseries around the country. Results are posted in the yearly Blackleg Management Guide, which groups commercially available varieties by their major gene for blackleg resistance. By using information from the guide, producers can rotate between different resistance groups to battle the disease and minimize the chance of resistance breakdown. In addition to the resistance groups, the guide is a full package deal that helps to calculate blackleg risk on a farm and in a crop and outlines best management practices for the disease. A lot can be learned from the Australians. Maybe one day we will have our own blackleg management guide in place in Canada. Justine Cornelsen, foreground, tours blackleg trials. Many staff have to wear a bug net because flies attack the face and go directly for the eyes. “For some reason, the flies didn’t like me but really harassed the guys I was with,” she says. Dan Orchard is the Canola Council of Canada agronomy specialist for the central Alberta north region.